Next month Microsoft's Games for Windows website is getting an overhauled online store that will make purchasing computer games through the site easier, support Microsoft Points and nearly double the number of available titles. The new streamlined digital store will launch on Nov. 15 with more than 100 titles, up from the sixty or so currently available on the website. Anyone with a Windows Live ID can login into the store without having to create a new account. "With Games for Windows Marketplace, we set out to create a digital store built for PC gamers end-to-end," said Kevin Unangst, senior global director, PC and Mobile Gaming, at Microsoft. "And by integrating with our existing Xbox LIVE and Windows Live services, we've made it easier than ever for millions of gamers to see for themselves how easy buying PC games can be." This overhaul of Games for Windows' online store puts Microsoft up against competitors like Valve's Steam and its more than 1,100 games and Stardock's Impulse service. The redesign of Games For Windows Marketplace reduces the number of clicks necessary to purchase a game. It also gives game publishers dedicated pages with the service and gamers the ability to redownload games they purchase if needed. Peter Orullian, Microsoft's group product manager for PC and Mobile, said the company also plans to have seasonal offers, a Deal of the Week and other recurring sales. Launch titles for the Games for Windows Marketplace will include Fable: The Lost Chapters and Grand Theft Auto III. Orullian says that developers Capcom, 2K Games and Square Enix have all also pledged to support the service. 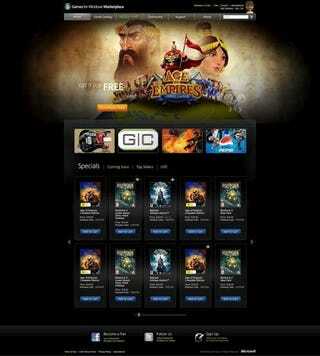 The service plans to offer indie titles and older titles in the store as well, Orullian said.